Salonga National Park is Africa's biggest tropical rainforest reserve. It consists of two locations: a northern and a southern sector, separated by a 40km wide settlement zone. It is a very isolated park, located at the central basin of the Congo river and crossected by many rivers. The park can only be reached via water transport, and in parts is considered to be completely virgin and never accessed by man. It covers an area of 3,656,000 ha. The park is also home to many endangered fauna species notably the bonobo. The bonobo or pygmy chimpanzee is only found in the wild here and in surrounding reserves. 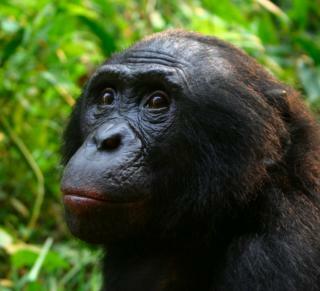 The bonobo diverges about 0.4 % from the common chimpanzee genome. It is possible that the formation of the Congo river led to the speciation of this particular chimpanzee species (they're not great swimmers). They're now an endangered species, with 29,500 - 50,000 individuals left. Early Pleistocene: "Along with the common chimpanzee, the bonobo is the closest extant relative to humans. Because the two species are not proficient swimmers, the formation of the Congo River 1.5–2 million years ago possibly led to the speciation of the bonobo. Bonobos live south of the river, and thereby were separated from the ancestors of the common chimpanzee, which live north of the river" and (also Wiki) "DNA evidence suggests the bonobo and common chimpanzee species effectively separated from each other fewer than one million years ago".